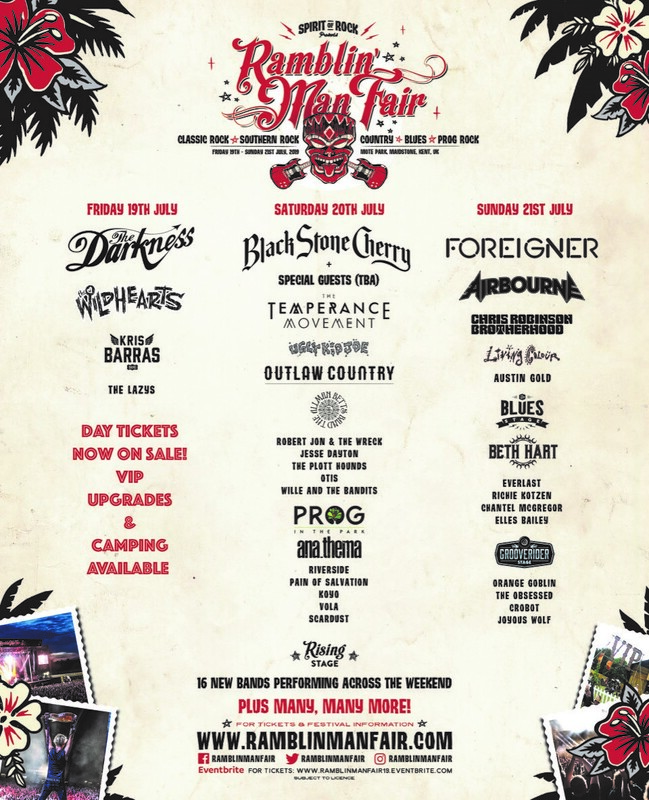 THE TEMPERANCE MOVEMENT (Saturday Main Stage) –Hailing from Scotland and coming off the back of an extremely successful album “A Deeper Cut, the five-piece is ready to join the already staggering Ramblin’ Man Fair lineup. Formed in 2011, The Temperance Movement released their critically acclaimed third album last year entering the UK album chart in the Top 10. “A Deeper Cut” showed the world The Temperance Movement are back with their defining sound, which blends lyrical intensity and flawless music performance into a continuum of exciting rock. The band has also been conquering stages across the UK and Europe, winning over legion of fans with their enticing live performances. EVERLAST (Sunday Blues Stage) – Once best known for his tenure in the rap unit House of Pain, Everlast successfully reinvented himself in 1998 with the best-selling Whitney Ford Sings the Blues. The critically acclaimed platinum selling record spurred a whole new career for Everlast which has gone from strength to strength most recently with last years release and his 8thsolo studio album ‘Whitney Ford’s House of Pain’. This year Everlast will bring his unique blend of blues to Ramblin’ Man Fair when he performs on the Blues Stage on Sunday 21st. THE WILDHEARTS (Friday Main Stage Special Guest), LIVING COLOUR (Main Stage), JESSE DAYTON (Outlaw Country Stage),KOYO (Prog in the Park Stage), ORANGE GOBLIN (Grooverider Stage), CROBOT (Grooverider Stage), OBSESSED (Grooverider Stage), ROBERT JON AND THE WRECK(Outlaw Stage) and CHRIS ROBINSON BROTHERHOOD as well asmore prog acts including Swedish act Pain of Salvationand polish prog giants Riverside. Also a wave of new rock talent including Kris Barras, Allman Betts Band, The Lazys, Austin Gold, Vola, Scardust, Wille & The Bandits, Elles Bailey, Chantel McGregor, Gin Annie, Outlaw Orchestra, Cellar Door Moon Crow, Fallen State, Dust Bowl Jokies, Rainbreakers, Matt Mitchell &The Coldhearts, Salvation Jayne and Ryders Creed. Next Eight more bands added to Bloodstock 2019!